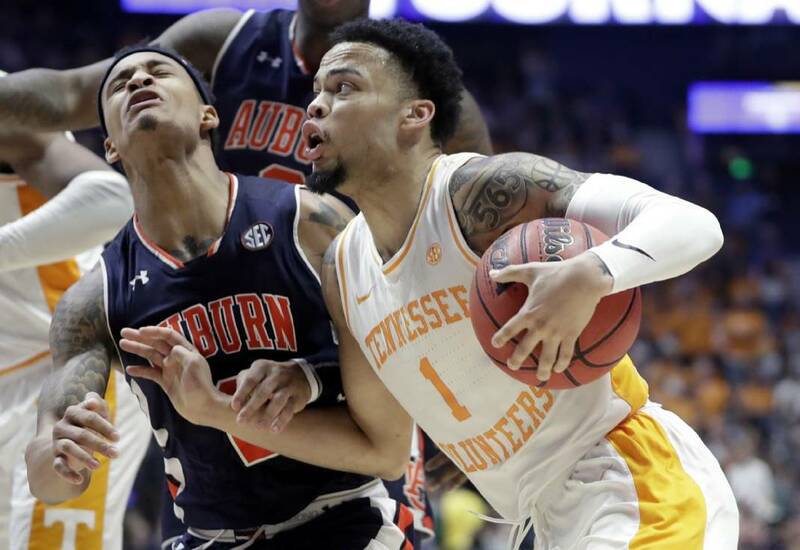 Tennessee's Lamonte Turner collides with Auburn's Bryce Brown on his way to the basket during the SEC tournament title game Sunday in Nashville. 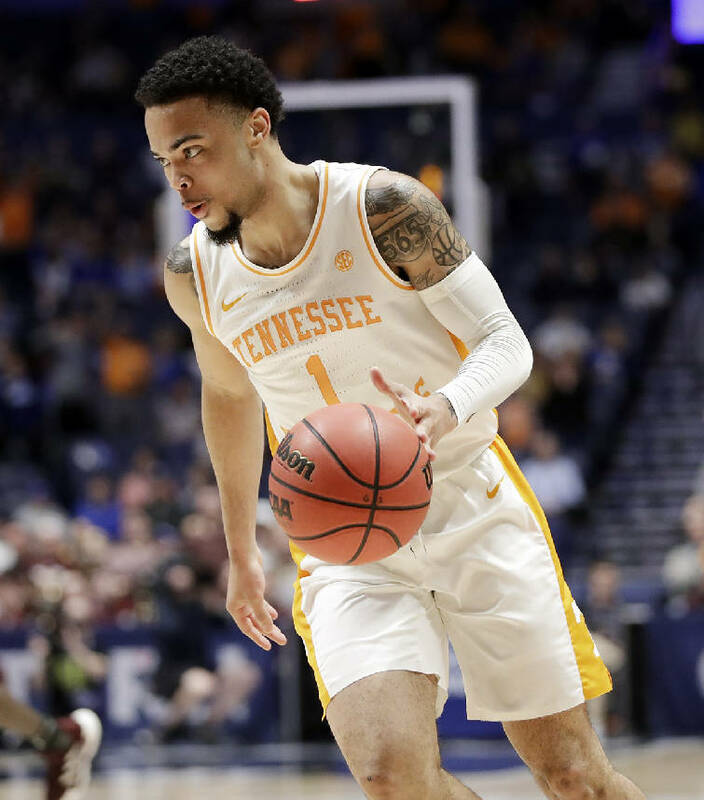 KNOXVILLE — If Lamonte Turner were just a few inches taller, there would be fewer issues. No questions about why he doesn't play like the prototypical point guard. No issues with his sometimes questionable shot selection. No outer frustrations about the bullish nature with which he plays. But because he's listed at 6-foot-2, the Tennessee junior is expected by some to just be a point guard. It's not his natural position; it's easy to see that with how he plays. Scoring is in his blood. So for four years, the challenge for the Tennessee coaching staff has been to develop those lead-guard skills while still allowing — within reason — Turner to be the type of player he is. That's one who has a never-give-up nature about himself and, of course, a short-term memory. So while he may frustrate with his "next shot is going in" nature — the ill-advised 3-point attempt against LSU in the game's final seconds, for instance, or the 1-for-8 showing against Auburn in the regular-season finale — coach Rick Barnes, his staff and Turner's teammates still encourage him to take shots. At least the right ones, and games like Saturday's against Kentucky are the reason why, when Turner's 3-pointer from the top of the key was the go-ahead basket in the Vols' 82-78 win over the Wildcats. It was Turner's second career game-winner against Kentucky, paired with the shot he hit in last season's game in Lexington. He followed that up with a team-high 24 points in the loss to Auburn in the Southeastern Conference tournament championship game, on 7-of-12 shooting and 4-of-6 from 3-point range. "Coach Barnes wants me to be able to do both," Turner said recently. "He wants me to score off the ball but when on the ball run the offense, and he's been teaching me when to do it and when not to do it. Being an older guy, I've learned how to balance the two, and that's been a big thing for me." But while his shot selection will always be a point of conversation, the rest of his game has quietly rounded out. He has a career-high 93 assists this season and is averaging 3.7 per game, also a career high. He has only 37 turnovers, and his 2.3 ratio of assists to turnovers is third in the SEC. Eight times this season he's had five or more assists in a game. He had done so eight times in his first two seasons. "I think it's a mindset for me now," Turner said after Saturday's win over Kentucky. "I think I've learned to do that (be a lead guard). It's just that, whether I want to do it or not. Tonight I wanted to focus on coming out, running the team, and I think I did a pretty good job of that. I think I can do that every night, but you've got to be locked in." That afternoon he had a pair of assists with two turnovers while harassing Kentucky guards all game. A night earlier he had eight assists to three turnovers in the quarterfinal win over Mississippi State, while being a thorn in the side of Bulldogs point guard Lamar Peters. "I tried not to come out tonight and focus on scoring," Turner said after the Kentucky game. "I just wanted to focus on things I could control like passing the ball, like playing defense, because when you focus on those things the scoring will come. I'm a natural scorer, and Coach Barnes tells me that if I don't focus on that, it'll happen naturally." Add that with Barnes' insistence that he become a better on-ball defender — which he's done — and the shaping of Turner from scoring guard to multi-dimensional one is a lot closer to nearing completion than it once was. "Lamonte, what we've always felt about him — and we feel the same thing about Jordan (Bone) — is that those two guys could be two of the best defensive guards in the country," Barnes said Monday. "Lamonte, what he's done the last couple games, he's been a guy that has truly wanted to embrace going against the best guard on the other team. I mean, he's asking for that. He really wants to do that. "When you get a team of guys thinking like that, now you've got something, where they really put defense first and understand that that's what it really is about. But Lamonte has embraced that as much as anybody in the last month, and I think because of what he's done with it, trying to really get better, that's helped our team overall on the perimeter. "He's a scorer, and yesterday he was a guy that, you know, like we talked about after the Kentucky game, he's going to take his shots, and he should. The reason he has missed some shots and had the percentage he's shot, he took some shots he shouldn't have taken. That's what the conversation was about — 'You're too good a shooter to be shooting that percentage, and you've got to ask yourself why, and then be able to own up to it,' and he did. He said, 'You're right.' He's wanting to make it. He's that much of a competitor. But he's got to realize, and he has realized more and more, that if he locks in, he's a much better player than he gives himself credit for. "Some guys totally look at scoring points — 'I've got to score, I've got to score, I've got to score.' If you're a volume shooter, you're going to score points, which is not a good thing from where I sit. But the fact of the matter is Lamonte can pass the ball, he can guard, he can score at different levels, which is good. But it's when he just thinks, 'I've got to stand out there and take tough 3s,' that's when he's not a very good basketball player. But when he's really being the player that he's capable of, again ... respecting all his other abilities is when he can really affect the game."